They said that summer in Berlin is the coolest time ever – so much going on, so many open airs, beer gardens, concerts, people hanging out… Can’t say if it’s all true, to be honest, because while Berlin was basking in the sunshine I’ve been lying in my bed, crying in my pillow, being completely unable to pull myself out. I wasn’t a chatty, outgoing, bubbly girl with contagious laughter. I was a moody, poignant, tongue-tied mess with anxiety attacks. I’ve been escaping to different cities and different countries, trying to ignore what really bothered me, trying to escape myself. But to be honest, even traveling couldn’t help me find that. So when one day, I was offered to literally jump off a skyscraper I thought it was perfect timing. No sarcasm. I mean, what could I really lose at that point? Lots of people fall off the roofs of Berlin’s skyscrapers every single day anyways. So on a crispy Sunday afternoon I went base flying with Jochen Schweizer, a German stuntman and entrepreneur, renowned for setting a world record in bungee jumping. Sounded like somebody I could really rely on. 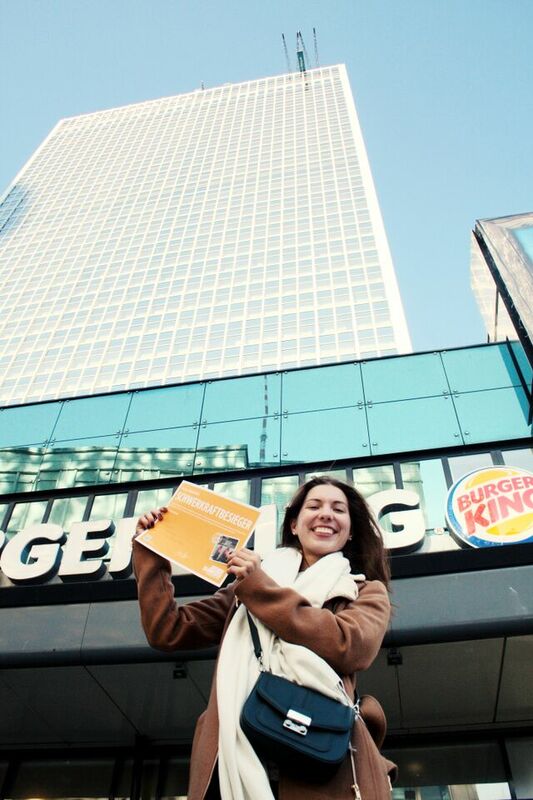 I was supposed to jump off Park Inn, a hotel at Alexanderplatz located just in front of the famous Berlin TV Tower. 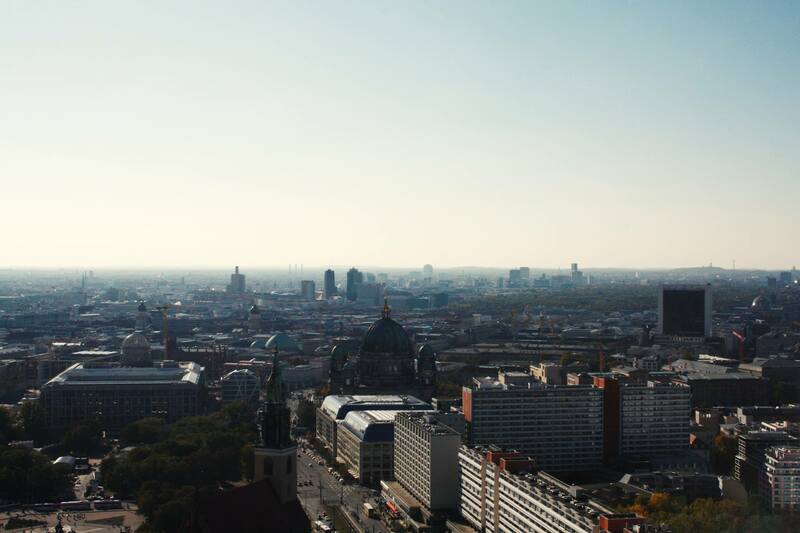 I went up – the view over Berlin was amazing, by the way – took few deep breaths and entered the arena where I had to fight all my fears (especially those that had to do anything with height). First they left me hanging in the air, spreading my arms like wings and looking down at the blue square I had to land on. Now I get how birds really feel on their first attempt to fly – absolutely terrified! The team was telling me to relax, smile and wave at the camera. Undergoing occasional attacks of nervous laughter, I was facing what I had to face: 125 meters of free fall. This equaled to 8 seconds of screaming, a dull heart ache and two big eyes full with fear. But funnily enough, somehow that all resulted in a happy smile in the end. While I was flying down, I realized that sometimes we’re more scared of the idea of falling rather than falling itself. Sometimes the only thing we fear in life is nothing but the fear itself – but the truth is, as soon as we recognize that, our fears somehow look just as small as a dot in Berlin’s cityscape spotted from the roof of a skyscraper. Insignificant. Fears are irrational. So the best way to deal with them is to be irrational. When nothing goes right – smile. When everything falls down – jump. In the end of the day, you are what you feel so counter-backing negativity with positivity and turning a minus into a plus will eventually turn your life around, too. Funny how jumping off a building made me realize that. As a part of the Berlin Welcome Card experience, I did base-flying with Jochen Schweizer upon an invitation from visitBerlin. I would like to thank them for giving me the biggest shot of adrenaline that I’ve ever had, but would also point out that all opinions on my blog are, as always, my own. It’s interesting how something like this can help you overcome negative thoughts! Looks like so much fun and I want to do it, too! It is, isn’t it? I’m very happy I did this – it was just 8 seconds but it somehow really energised me and gave me a second breath to deal with my stuff. And god knows, there’s a lot of it been happening this summer! 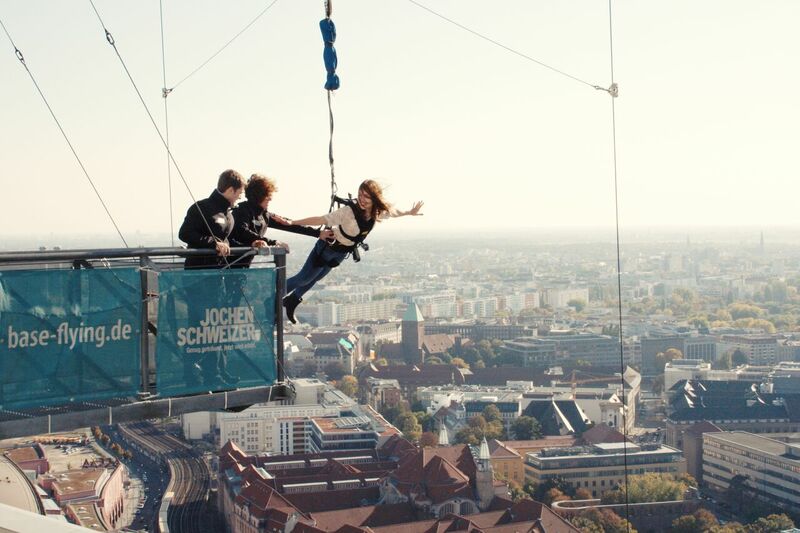 You should totally try this when you visit Berlin :) Really worth it! I did help, for sure! And yes, I agree: the best way to conquer fear is to contradict it with fearlessness!